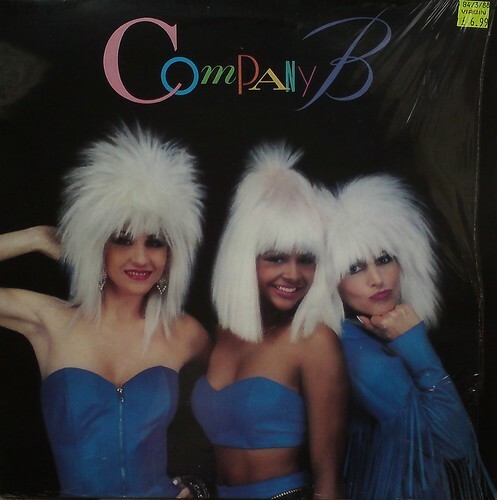 As far as I can tell, this all-girl group never made the slightest impression on this side of the pond. Released on Atlantic Records in the States, this is a UK issue of their debut album on the obscure Blue Bird label, which you could buy in Virgin for £6.99 back in the day. I came across this pristine copy last week in the Fishponds branch of Cancer Research UK. It was going for a quid, just begging me to take it home. So I did. Company B’s Wiki page gives a brief synopsis of their career. This album, released in 1987, was produced, arranged and engineered by a fella called Ish in Miami. The stand-out track is opener “Fascinated”, which apparently did quite well Stateside. I recognised the song straight away because a Housed-up cover version was a moderate hit over here for Lisa B. in the following decade. But the whole album is a cute example of that near-forgotten, pre-House, Latin-tinged yet strangely Europhile electronic dance sound known as Freestyle. I dunno, you go for all those years without having even heard of the bloke, and then two Chico Arnez albums come along (almost) at the same time! Two years on from his “New Sounds”, and not much had changed in Chico Land, except his sounds were now simply just ‘Exciting’, there were more vocals, and there were no gaps between tracks – what a rush! He was still doing the “Hawaii Five-O” theme, but his radical re-imagining of “Spirit In The Sky” is a thing of wonder. So now I’m wondering (whilst admiring the bone structure of the model on the sleeve) how many more records this guy managed to make? There’s always that slim hope, whenever I come across an Hawaiian album, that it will inadvertently sound a bit strange and other-worldly, like Martin Denny. 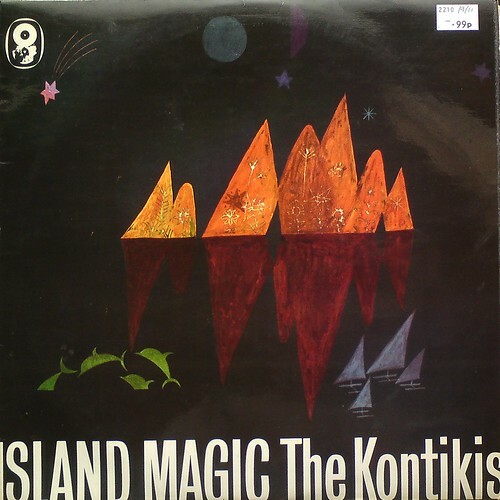 Alas, The Kontikis fail to deliver on that score, though it’s quite a pleasant listen, and I like the fact that the sleeve art is unusually, erm, dark. 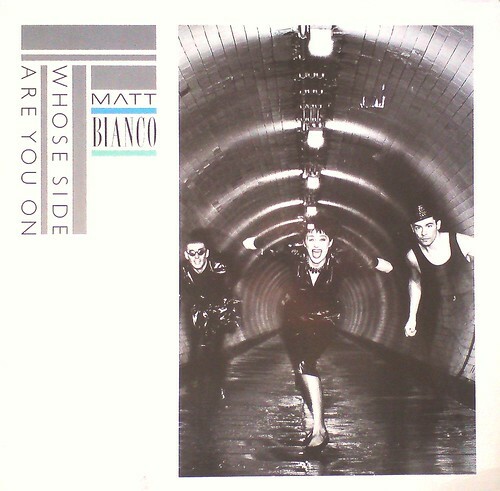 Matt Bianco were one of those groups, along with the likes of Modern Romance and Everything But The Girl, who tried to graft a bit of the old latin magic onto the new dance pop of the ’80s, bringing those South American grooves back in from the cold after they were so thoroughly vanquished during the disco-boom of the mid-late ’70s. The title track of this album, along with “Half A Minute” and “Get Out Of Your Lazy Bed” were big hits back in the day, very familiar to these ears and consequently high on instant nostalgia gratification. The rest of the album keeps up a pretty high standard – listening on headphones I’m particularly enjoying the densely layered percussion of “Matt’s Mood” and the sequenced basslines are surprisingly fat and funky throughout- is that the tell-tale swerve of a TB-303 I hear on “Sneaking Out The Back Door”? I reckon the male vocalist, Mark Reilly, was outclassed by the rest of his group, but there’s no mistaking the talents of the female vocalist Basia Trzetrzelewska, who’s super-clean spangly harmonies really lift the roof off. All round, a surprisingly enjoyable experience. 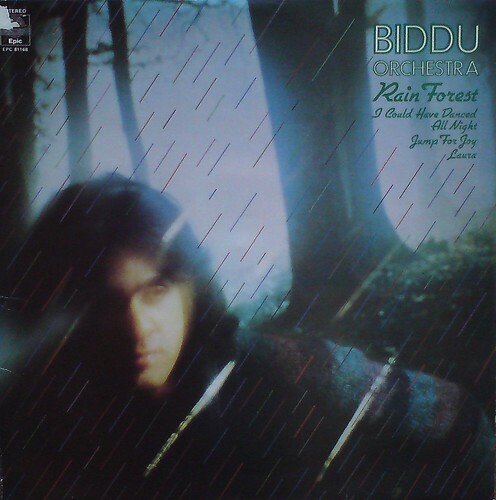 Another one from Biddu. It seems like there was a brief period, in the mid-’70s, when this guy was spearheading the British disco sound. But by the 1980s he was already a distant memory, having returned to his native India to focus on producing music there. Check his Wiki page for more info. There’s some nice cuts on the this album. 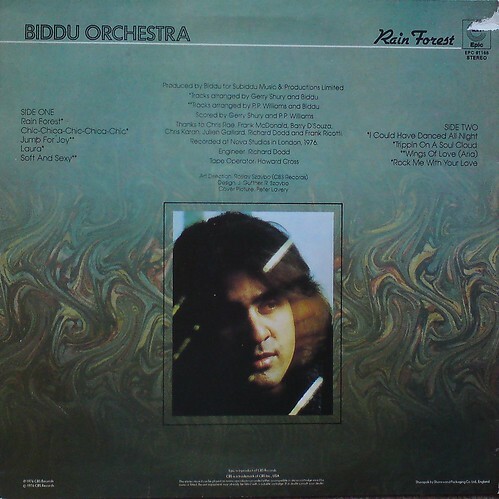 It’s funny the way they list all the technical people, but not the actual musicians in Biddu’s orchestra. So we know that the Tape Op at Nova Studios was a fella called Howard Cross, but we have no idea who was responsible for laying down that sweet chicken-scratch guitar on “Chic-Chica-Chic-Chica-Chic”. 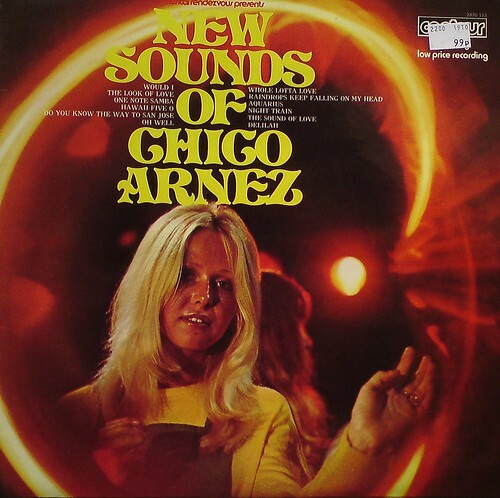 The year is 1972 and Chico Arnez, until recently associated with the ‘Latin-Amercian sound’, is unveiling his ‘New Sounds’ on this radical album on Contour. But how to describe this New Sound? The sleeve notes mention “exploratory arrangements to create an exciting sound to listen to and a very ‘Disco-type’ mood to dance to”. 37 years later, it’s quite hard to discern the ‘newness’. I can just about buy the idea that Chico was a forgotten pivotal figure in the transition from ‘Easy-Latin’ to ‘Easy-Disco’, and some of these arrangements, particularly the re-workings of “One Note Samba” and Fleetwood Mac’s “Oh Well”, are actually quite engaging, and yes the drums are unusually loud and dynamic in the mix and the horns and woodwind are screaming for attention, etc…but it’s still basically an easy listening record, with no obvious stylistic invention that I can discern. Certainly there’s nothing here that could be described as ‘Disco’ as we understand it today. But let’s give Chico a break – it’s only 1972 ferchrissakes. On the rear sleeve of this copy, scrawled in biro along the top, reads: “To Jim, With My Best Wishes, Chico Arnez”. Nice touch! I have mixed feeling about the Electric Light Orchestra. Back in the late ’70s I thought they were the best band in the world. Then my tastes ‘matured’ and I went off them. But, y’know, I still have a bit of a soft spot for Jeff, Bev and the gang. 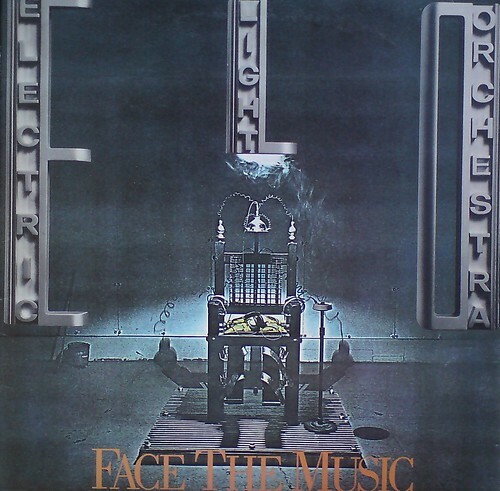 ELO’s big-selling albums like “Out Of The Blue” are, of course, regular fixtures on the charity shop ‘scene’, but this was the first time I’d come across their 1975 opus “Face The Music”, and curiosity got the better of me. 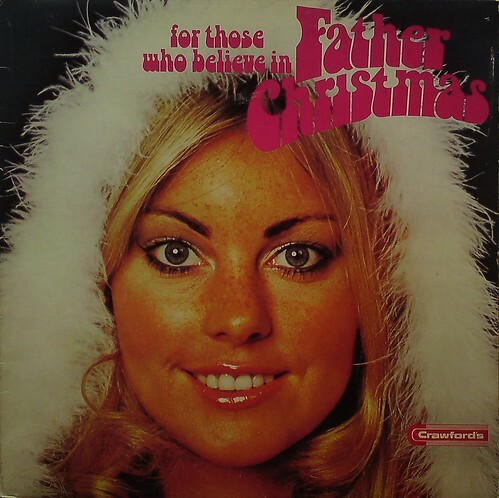 A quick bit of research reveals that this one never made any impression on the album charts, despite respectable chart placings for their earlier albums, and despite featuring one sizeable hit single in the shape of “Evil Woman”. So “Face The Music” was, by ELO’s standards, a flop. I wonder why? It sounds just like all the other ELO in terms of production, song-craft, etc. Instrumental opener “Fire On High” is a bit experimental at the start, “Poker” is surprisingly fast and noisy, yet the ballad “Strange Magic” is as lush and syrupy as anything else in the ELO repertoire. 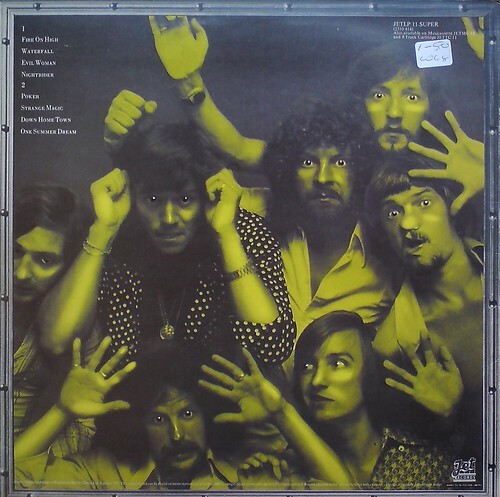 Maybe it was that scary photo of the group on the rear sleeve that put-off the punters. I can just imagine some poor unsuspecting shopper picking this out of the racks, flipping it over to check the tracklist and then recoiling in horror at those seven pairs of eyes glaring psychotically back at him. Interesting to note that, after this album, Jeff Lynn was never again seen without his shades on. Following on from this post, I found another piece of the Average White Band jigsaw, from further back in time, and another step nearer to their first album – the one that is, according my friend in the comments box, ‘the one to get’. 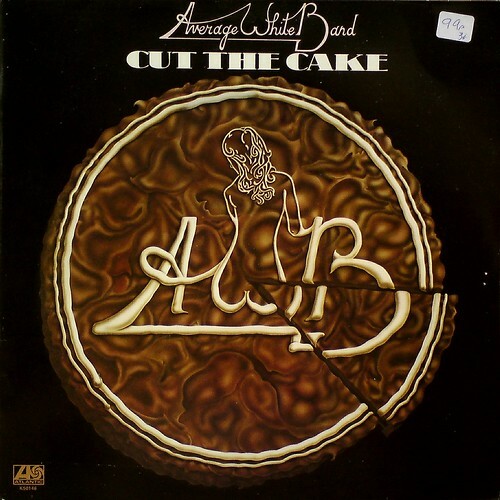 “Cut The Cake” is apparently ‘pale in comparison’, but I’m quite enjoying it anyway, not yet having had the opportunity to make that unfavourable comparison with their earlier masterpiece. Ignorance is bliss. I was surprised to discover that the beginning of “School Boy Crush” was the source of the 1-bar sample loop that propels my absolute favourite Eric B. & Rakim tune “Microphone Fiend”, sleigh bells and all! It’s odd how many records from the German Telefunken label end up in British charity shop bins. How did they all get here in the first place? We managed to keep out the Luftwaffe, but we couldn’t stem the insidious tide of tasteless Telefunken platters. 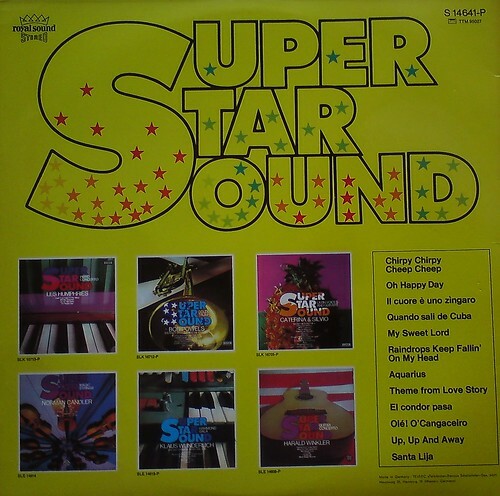 This one is a sampler for their ‘Super Star Sound’ series, featuring dear old Klaus Wunderlich along with a bunch of other easy/cheesy artists who were, presumably, ‘big in Germany’ at the time. To be honest, most of this stuff (like Bob Powell‘s infernal version of ‘Chirpy Chirpy Cheep Cheep’) could be used as a method of torture, although I was quite intrigued by Norman Chandler‘s orchestral reading of “My Sweet Lord”, on account of the heavy use of electronic filters to ‘treat’ the strings, resulting in some quite satisfying psychedelic swirls of sound. 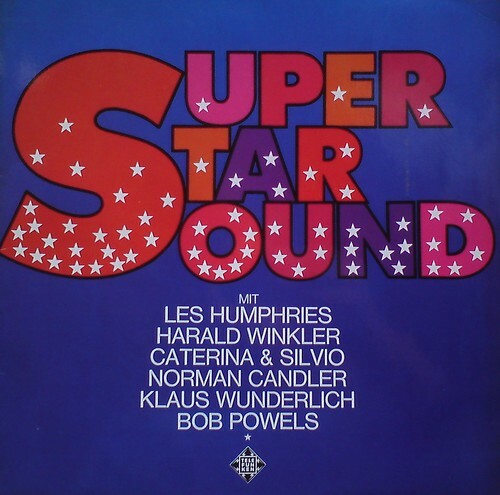 ‘Serious’ artists like Stockhausen and Klaus Schulze used similar effects, but I’ve not heard anything quite so weird applied to a mainstream record of the period. The nearest comparison I can think of would be some of John Keating’s stuff. Anyway, that track is from an album called ‘Magic Strings’, which might possibly be worth bagging if you see a copy for 50p.